"With antibiotic resistance becoming increasingly problematic and academia being left with the burden of finding a solution, international collaboration between different laboratories with complimentary interdisciplinary approaches improves the rate of advance and discovery." In 2017, I had the opportunity to work with Dr. Jonathan Dworkin and his lab at Columbia University, New York City, USA during a 3 month secondment. This work was supported by two grants: the Royal Society of Chemistry 'Research Mobility Grant' and a Warwick INTEGRATE AMR 'Visiting Fellowship'. Dr. Dworkin is an expert on Serine/Threonine kinases (STK) and has published a number of papers characterizing the STK in Bacillus subtilis, PrkC. Throughout my PhD it become apparent the PrkC homologue in E. faecalis is increasingly important for antibiotic resistance in that organism. Working in Dr. Dworkin's lab enabled me to learn and use live cell imaging techniques that were not available to me during my PhD and gain a greater understanding of the function of STKs in Enterococcus. When I arrived in New York, I had residence secured at International House, an institute built by the Rockefellers dedicated to Graduate Studies at any of the New York Universities’, and internship schemes. I managed to quickly find my feet on arrival after being welcomed into the community and formed a network of friendships, from people working at the United Nations, undertaking internships in various companies and also partaking in research studies at various different institutes. Being in such an environment enabled me to focus on my project and research whilst also providing me with a social outlet to explore such a busy and vibrant city. My arrival at Columbia University was also a quick transition. Jonathan had ensured I knew the quickest way to travel to the lab by meeting me outside International House on my first day. The lab induction was a simple process and after a meeting to set out the objectives of my secondment, I was setting up my first experiments. During my initial week, I also had the opportunity to present a talk on my research at Warwick at a joint interest group meeting (NY:BIG) at New York City University. It was a great opportunity to meet and listen to other researchers in microbiology in the NYC community. The skills and expertise I learnt in Jonathan's lab were invaluable and also enabled me to collect a wide set of data which will not only form key components in my thesis but are also being collated together into research papers. Due to confidentiality requirements, I am unable to summarise key research discoveries but I will follow up with summary posts once they are published. The text below summarises one of the many experiments in the lab, where we were interested in localisation of the STK in E. faecalis. Localization of the STK in E. faecalis. 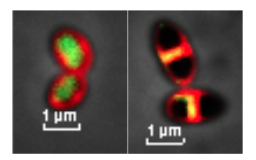 Left: GFP only localizing to the cytoplasm, Right: GFP-STK fusion demonstrating localisation to the membrane and the septum of growing E. faecalis cells. It can be seen clearly on the left that GFP without any tagged protein is expressed and distributed throughout the cytoplasm. When fused with E. faecalis STK, we see localization not only to the membrane, but also to the septum, the region where peptidoglycan synthesis occurs in this particular species. We have been in regular contact since my return and have clear objectives to complete to help answer some of the key questions in AMR in E. faecalis. My PhD project, looking into the resistance mechanisms against antibiotics in Enterococcus faecalis, is currently supervised my Prof. David Roper (School of Life Science) and Dr. Ann Dixon (Chemistry) at the University of Warwick, so already entails a large interdisciplinary aspect. I have been fortunate to collaborate with many academics from different institutes including Dr. Stephane Mesnage from the University of Sheffield for his expertise in E. faecalis molecular genetics and Dr. David Scott at the University of Nottingham and Harwell Research Complex for his expertise in biophysical techniques in the characterisation of proteins. Find out more about my ongoing AMR Early Career Fellowship here.